Progressive Seeds offers Blue Dawn Brunswick grass seeds to create durable soft lawns. 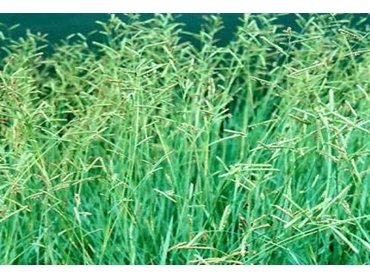 Widely used for ground cover, Brunswick grass is a mat-forming perennial grass with long underground stems. The foliage is usually 20-30cm deep and seedheads carried on erect stems are 10-20cm above the foliage. The leaves are grey-green in colour and grow to about 30cm in length and 5-6mm in width. The widely adapted grass shows moderate tolerance to drought and frost as well as heavy grazing. Best sown in areas receiving 1000-1500mm rainfall annually, its tolerance of dry conditions allows successful growth in upland areas receiving annual rainfall as low as 700mm. No serious insect or disease problems are associated with this grass variety. Brunswick grass is used in permanent pasture in the subtropics and may have application for hay and silage. The grass is not suited to short-term pasture due to control issues. Its ability to form a good ground cover makes Brunswick grass suitable for soil conservation and stabilisation of waterways. Moderately shade tolerant, Brunswick grass can be grown under more open tree canopies. Brunswick grass can be sown in sandy soils as well as light to medium clays and hard-setting sandy clay loams, provided internal drainage is reasonable and moisture is adequate. Though it survives short periods of flooding, it does not tolerate permanent waterlogging. Frost tolerance of Brunswick grass is comparable to the kikuyu grass variety but the foliage is burnt off by severe frost and makes no further growth in winter, though it makes good recovery with the arrival of warmer conditions. Brunswick grass is prone to suppressing other grass varieties such as mat grass, blady grass, blue couch and spear grass in addition to broadleaf weeds such as blue heliotrope. Being a warm season grass, it is best planted any time from spring to autumn. The grass will establish successfully on most soils with minimum fertiliser inputs. Brunswick grass is extremely tolerant of grazing, forming a low dense cover under regular mowing or continuous grazing. This grass variety is palatable for cattle.